2014 International Sales Meeting | Chemtrac, Inc.
Chemtrac recently hosted their 2014 International Sales Meeting at the Crowne Plaza Hotel in Atlanta. In attendance were 45 Manufacturer’s Representatives and Distributors, from throughout the United States, 11 countries, and 6 continents. Another 15 Chemtrac employees also took part in the event. 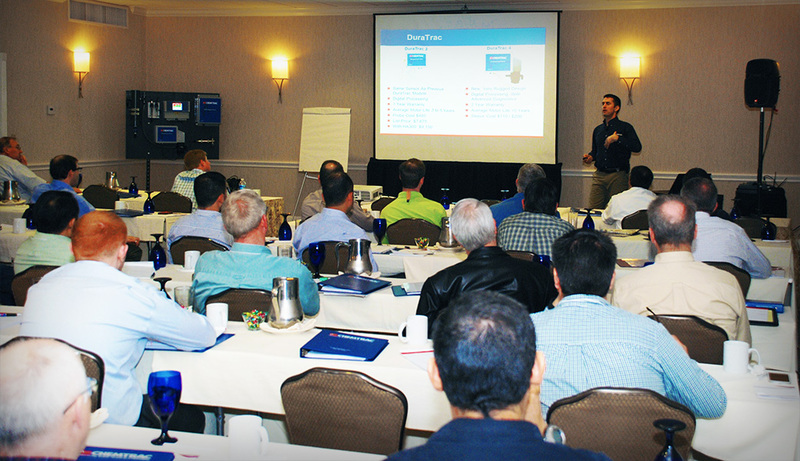 The objectives were to introduce new products, reemphasize important information regarding existing monitors, discuss product applications, and allow for all attendees to have hands-on training with each of the primary analyzer types. The meeting kicked off with a Welcome Dinner on Monday, February 24. Then, over the next two days, the meeting was held in various onsite ballrooms. The participants ranged from a veteran who has represented Chemtrac for more than 25 years, to those who are relatively new to selling the Chemtrac line. The entire group listened to presentations from Dave Painter, President; John Clark, VP & GM; and Mark Vandiver, Manager of Market Development. Then the reps were split into breakout groups of 8-10, and rotated through five different training sessions. The session topics included: liquid particle detection theory, and particle counter operation and calibration; online streaming current monitoring and the new DuraTrac 4 Streaming Current Sensor; using the CCA3100 Laboratory Coagulant Charge Analyzer to conduct a 5-minute jar test; monitor and control with the HydroACT series of multi-parameter analyzers; and an overview of available sensors…residual chlorine, ORP, pH, UV254 organics, dissolved oxygen, etc. Two days of technical sales sessions, great food, and lots of discussions of Chemtrac successes: past, present, and future.